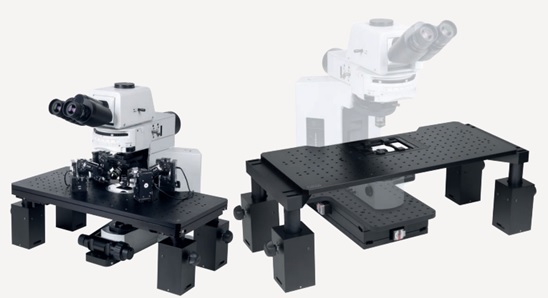 The Z-Deck range from Prior Scientific set the benchmark for top quality, height adjustable platforms designed specifically for upright microscopes used in electrophysiology and neuroscience applications, including Nikon FN1, Olympus BX51WI or BX61WI, Zeiss Axio Examiner and Leica DM6 microscopes. To meet the differing requirements and budgets of scientists, Prior Scientific offers a range of Z-Deck platforms. For experiments that demand precise movements in the X and Y axes the motorised Z-Deck with sub-micron resolution and Prior’s patented IST technology provides unmatched accuracy and repeatability. The motors of the Z-Deck can be easily switched off during recording without the loss of position. By comparison the manual Z-Deck enables manual experiment movement in the X and Y axes, at an entry-level price. If your experiment does not require XY movement from the stage at all, the Fixed Z-Deck offers a robust, stable, and rapidly height adjustable platform. Both the fixed and manual Z-Deck platforms have no electrical motors and thus produce no electrical noise making them ideal for researchers performing extremely precise measurements requiring constant electrical silence.